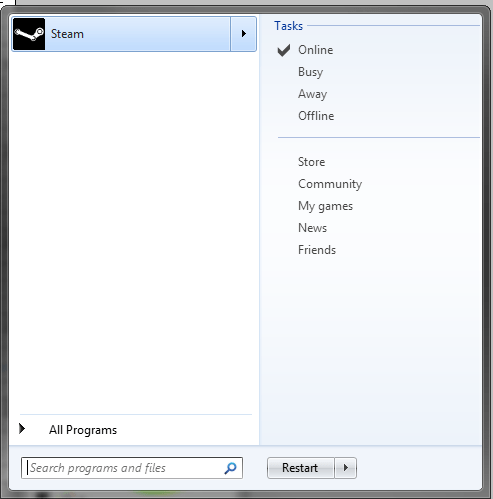 Valve has done a great work integration Steam with Windows 7. The icon in the taskbar shows the download status of all the currently downloading items. This was demos in my case. 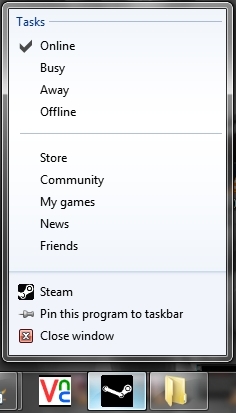 I have the Steam icon in my start menu list and it has an extended menu allowing you to change status on Steam Friends. This is a fine example of good OS integration from a third part software vendor. I.T software professional always studying and applying the knowledge gained and one way of doing this is to blog. Danny also has participates in a part time project called Energy@Home [http://code.google.com/p/energyathome/] for monitoring energy usage on a premise. Dedicated to I.T since studying pure Information Technology since the age of 16, Danny Tsang working in the field that he has aimed for since leaving school. View all posts by Danny →	This entry was posted in Games, Windows and tagged Steam, taskbar, Valve, Windows. Bookmark the permalink.